We have begun counting down the days to Christmas at our house. In order to keep two rambunctious boys a little calm about the upcoming festivities, we've been keeping busy with Christmas activities. Each day we are reading Christmas stories and doing Christmas crafts and activities. 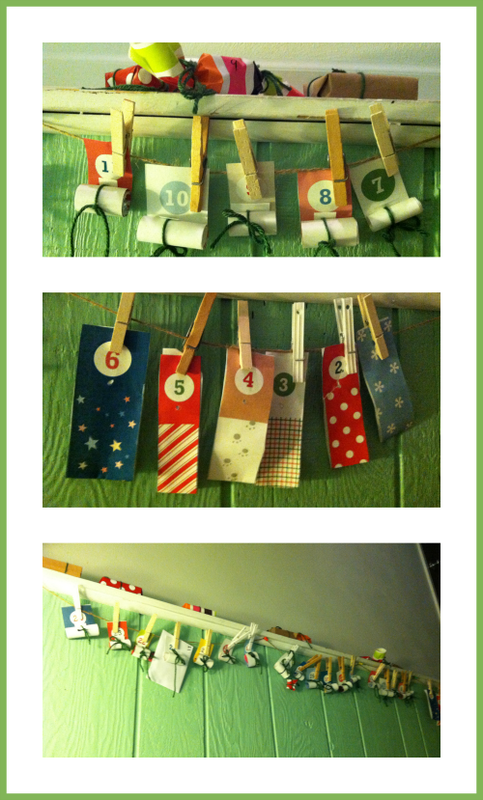 Each night we are opening our advent calendar as a family and reading one part of the Christmas story from the Bible. Some of our Christmas activities are from previous years and some are new. I've been working hard to create a page that archives all of our previous Christmas stories and Christmas activities for kids. We began our Christmas countdown this year by reading "The Wild Christmas Reindeer" by Jan Brett. This is the perfect first book for beginning a Christmas countdown. Each page in Brett's book is framed by a detailed border that depicts the month of December. Each day is show with a calendar page as well as with an illustration of activities at the North Pole. I used this book to introduce our own advent calendar. This year I used free printables from Mr. Printables. I rolled them up with the verses and gift ideas from Sweeter Than Sweets. On some, I tucked the "prize" right inside. For others with large gifts, I wrapped them and set the gifts above the calendar. As we open each day, the leftover paper makes a cute Christmas bunting. While the frames of the book form an "advent calendar", the book also tells a story. The story is of Teeka, a girl who lives "in the shadow of Santa's winter farm". Teeka has the job of rounding up wild reindeer and training them for Christmas. This is a hard job for Teeka and she becomes frustrated and often angry with the reindeer. In the end, she learns that she will not be able to train the reindeer by yelling at them. She apologizes and continues her work with a kinder attitude toward the animals. Side note: This book was inspiring to me. As a mom, I could relate to Teeka. While I don't have wild reindeer at my house, my two boys resemble wild animals more than little boys right now. They are just so excited about Christmas, I guess. Teeka inspires me to "train" with kindness. I need remember Teeka's words, "no yelling, no screaming, and no bossing, I promise." While I found a good lesson in the book, I tried to think about a lesson the boys could learn. I decided to help the boys think about being kind to animals during the winter season. While I also want them to be kind to each other, it's easy for kids to learn lessons of kindness with animals. Most kids naturally love animals and want to be kind to them. Tallking about how we could be kind to animals led us to the book, Night Tree by Eve Bunting. In this story a family visits the forest every year. Instead of chopping down a Christmas tree, they fill the tree with popcorn chains, apples, and other goodies for the forest animals to enjoy. We live on a wooded lot but it is a deciduous "forest" and not one evergreen tree grows on our entire lot. Our trees are all massively large and not good for decorating. Because our lot is steep and somewhat dangerous for small boys, we have a fence separating our "yard" from our "forest". We decorated our fence for the forest animals. We made ornaments of stale bagels with peanut butter and sunflower seeds. 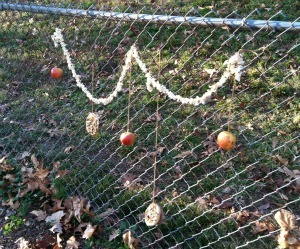 We hung apples from strings. 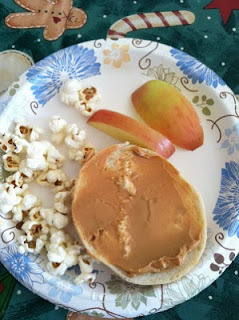 We made popcorn chains and scattered nuts, bread crumbs, and apple pieces for the small animals. We were able to use up a lot of leftovers and help feed hungry animals. 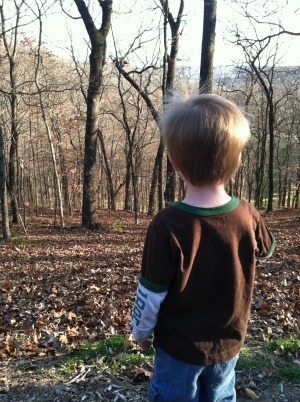 After finishing our work, Tyson stood at the edge of the forest and yelled, "Come and get it!" Then he went inside and ate his own "animal snack". Hopefully we can spread Christmas kindness to all creatures great and small this year! The above comment looks like spam, both of them. That is so cute Tyson yelled, "Come and get it!" Is the Advent story a continuous one, a little more each day? If so, great, if not that would be a good idea. I am following a Christmas around the world series and Santa comes more than once in Germany, and I am thinking I understand why! Good luck with the training. Thank you for the excellent titles and thoughts.